Roslavets is one of those composers whose music to all intents and purposes didn’t actually exist at the time my interest in art-music began, in the early 1970s. That it does now is largely due to Gorbachev and glasnost and a quarter of a century or so after that momentous period, while his oeuvre may not exactly be a cornerstone of the repertoire it is considered sufficiently important to have been recorded by artists of the calibre of Hamelin, Grindenko, Ibragimova and Schleiermacher among others. I’m certainly not in a position to question what I feel is their excellent judgement. His works form something of the missing link between the theosophically inspired musings of Scriabin and the hard-edged steely constructivism of Mosolov, another composer whose star has risen in the last two decades beyond the legend of his ‘one-hit-wonder’, Zavod (Iron Foundry). 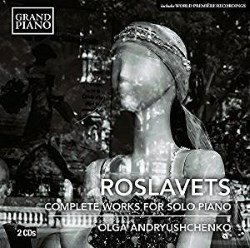 What we have here in this splendid Grand Piano 2CD set is what are assumed to be all of Roslavets’ surviving piano works performed by the young Muscovite Olga Andryushchenko, who is gaining something of a reputation as the doyenne of ‘reinstated’ 20th Century Russian piano repertoire, having recently released a similar survey of Mosolov’s surviving solo piano oeuvre on the same label. Richard Kraus evidently enjoyed this and his MusicWeb review can be accessed here. So, complete, as this set may be, the comparison that needs to be made is with the disc which is its most comprehensive competitor. Marc-André Hamelin recorded a Roslavets disc for Hyperion back in 1996 (CDA 66296) It was universally well-received and contains all the pieces on the first disc of the new set, as well as the Trois Études, the Cinq Préludes and the Sonata No 5 from the second. So the previously unreleased material on the new set amounts to roughly a quarter of an hour of miniatures, some of which have been reconstructed by the annotator, Marina Lobanova. Lest I sound as though these additions are insignificant, let me say that all are both fascinating and enjoyable, although I’m not sure they really add to the sum total of our understanding of this enigmatic composer. The real point here is that Ms Andryushchenko is a compelling player and an illuminating guide to all of this music, she is vividly recorded and she offers a somewhat different approach in this repertoire to Hamelin, and largely because it has no real performing tradition to speak of, I have found her accounts just as riveting as those by her more celebrated rival. Part of the success of these discs lies in this pianist’s objectivity. Like a later Russian modern, Galina Ustvolskaya, Roslavets favours very neutral titles, so we encounter Sonatas, Préludes, Études and perhaps most revealingly ‘Compositions’. No programmes, no descriptive clues. On the one hand, this perhaps allows the performer more latitude in interpretation but I strongly sense that Ms Andryushchenko consistently veers toward the futurist, constructivist view of Roslavets as opposed to the headier Scriabinesque readings presented by Hamelin. In most cases her takes on the overlapping works are slower, but they emphasise the ostinatos, the rhythmic patterns, the insistent motifs; there is a harder edge to the recording; the Hamelin disc has a softer, hazier hue: Hamelin’s extraordinary virtuosity is certainly to the fore, but the music is never exploited as a vehicle for that specific purpose. I perceive greater expressive freedom in his interpretations, at times you can almost smell the incense. Andryushchenko is more angular and muscular. Instinctively, both approaches seem valid – I really respond to Roslavets and having lived with (and loved) the Hamelin for so long I was (unfairly) rather expecting the new discs to fall short. They don’t - in no way do they disappoint. The two discs in the new survey present these works in a broadly chronological sequence so that it is possible to trace some sort of development although the composition of all of these pieces was compressed into a brief nine-year period. Thus the two earlier sonatas are in my view more languid, more overtly Scriabinesque than the Fifth; the Deux Poèmes of 1920 and especially the Cinq Préludes appear to usher in greater propulsiveness and clarity – in these later works I feel Andryushchenko’s approach pays real dividends and illuminates the links to the short-lived experiments of Roslavets’ successors. (In her note relating to the Cinq Préludes Dr Lobanova even makes the link between Roslavets and Webern). Ultimately, then, for those of you who are like me, Roslavets buffs (and who may already possess Hamelin’s recording) I really don’t feel this is a case of ‘either/or’. I enthusiastically commend both recordings to you. Completists will want the new set regardless and need not hesitate. As for those readers who are yet to encounter this fascinating figure, please fear not – Roslavets’ work is appealing on a number of levels and you will find much to enjoy on this terrific pair of discs. As a footnote I harbour the hope that Olga Andryushchenko might be persuaded to record the sonatas of another fascinating contemporary figure – Sergei Protopopov.